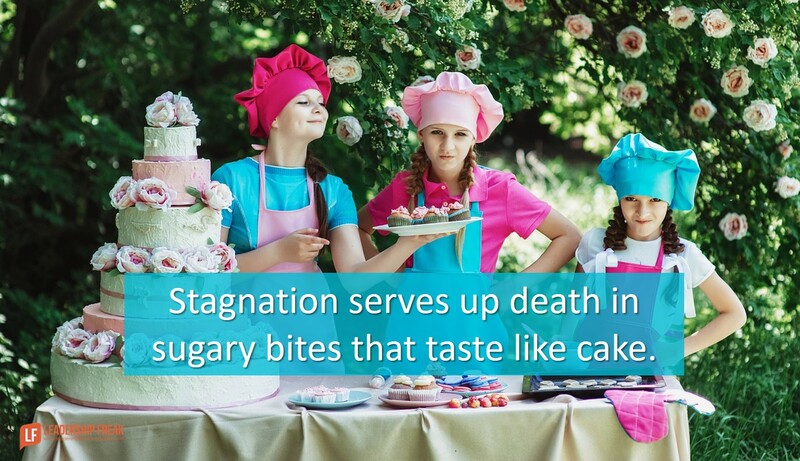 Stagnation serves up death in sugary bites that taste like cake. Regardless of the contents of your leadership, you found it moving forward. The opposite of forward is stagnation. Exploring options without choosing any. Repetition minus purpose. Busywork is death incognito. Procrastination under the guise of preparation. Stagnation loves it when you’re always getting ready to do something, but never doing it. Remove forward from your vocabulary and all you have left is stagnation and death. The latter being a slow form of the former. You find the leadership you want wrapped in brown paper with dings and tears along the road to somewhere else. It never comes with bows. It’s often unexpected. You find it while moving forward. Anyone – including yourself – who blocks forward movement is evil. Coddling-colleagues who justify complaints and concerns. Excuse makers who couldn’t dream their way out of a wet paper bag. Cowards with puffy chests who choose safety over stepping forward. People who use, “Give it time.” as a reason to ease up. The most important word in leadership is forward. We love leadership words like mission, vision, values, ethics, passion, talent, and strengths. But they’re all drivel apart from forward. What good is a strength that doesn’t move you forward? The ultimate question of leadership is how are we moving forward today. Yes, forward ethically. Yes, forward leveraging strengths. But always forward. When you stop moving forward you stop leading. Give a leader time off and they start prancing like a racehorse in the starting gate. All who love ease are sinister destroyers. Rest and reflection are not an end in themselves. The purpose of rest and reflection is energy and impatience to move forward. How might leaders defeat stagnation and enable forward movement? My predecessor was a firm believer in over-analysis, and I’ve absorbed a staff of middle managers who fit those top four stagnation categories to a T. Any supervisory advice on how to move them from students of issues to project managers? Nice! I thought, “Stagnation is the breakfast of many average managers” since it seems so common in organizations. Some seem to see it as risk avoidance, when it seems that the reality is that these choices are extraordinarily risky ones for individuals, departments and organizations. We need to start stressing FACILITATION as a leadership and basic management skill, the act of involving and engaging people in continuous continuous improvement. “How might leaders defeat stagnation and enable forward movement?” Always have, permit two way openness, listening and understanding, put simply ‘discussion’, preferably face to face, between themselves and their colleagues, their employees. Complimenting and critiquing, appropriately, timely. I use the word ‘critiquing’ rather than ‘criticize’, in my mind ‘critique’ involves thought, discussion, ‘criticize’ could be taken more as an attack and nobody, nobody, as far as I am aware, likes to be attacked, feel devalued, made to feel as if they have to be defensive. If you make someone ‘defensive’, how much has the, is the ‘criticizer’ costing an organisation, by making someone like this? Always encourage, explore fully, new ideas, never do anything on a ‘whim’ moment, never close off their minds (apart from on their time off of course, ‘me time’ as I would refer to it as, everyone needs that, it is what can kick start the thought train once again, make things a little clearer than what they were the day before). Try not to allow themselves to become blinkered. You hit the nail on the head in this post. Leadership is about moving forward as opposed to paralysis from analysis or paralysis from fear.